With over 150 fabric selections to choose from in a variety of patterns, solids, and stripes, you're sure to find a rocking chair seat cushion that you love by clicking on any of the options below. A seat cushion helps to make your rocking chair look more complete. 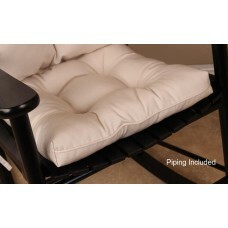 It also helps you stay comfortable so you can sit, rock, and relax for hours! We've got classic seat cushions and Sunbrella seat cushions, so start shopping now. Over 90 pattern fabric choices! Over 50 striped fabric choices! High quality solid color seat cushions. 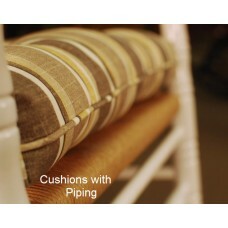 Over 60 Sunbrella fabrics to choose from. 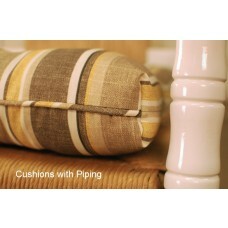 A rocking chair seat cushion simply adds a little something more to your rocking chair. It's that touch of style that offers a more "finished" look. It creates a sense that the chair is part of the decor: not just a random piece that you placed for the sake of convenience. We'll even send you swatches so that you can be absolutely certain that your new rocking chair seat cushion compliments whichever room you place it in! Each of these seat cushions is comfortable enough for the indoors but hardy enough for outdoor use, too, so you can use them anywhere you might want to sit for a spell. Choose from three standard sizes: standard, jumbo, and XL jumbo, or order your own custom size. No matter which cushion set you order, they're all custom made in the USA, offering unparalleled quality and a fine, professional fit for your rocking chair. It's the little things that matter, so go on! Give yourself an opportunity to add a touch of personalized beauty to your rocking chair. Click on any of the entries above to learn more about our fabric chair cushions!